Riot is offering some great prizes to League of Legends fans who submit a comic to the contest. Artistic League of Legends fans, this contest's for you. Riot has announced a new contest calling for funny, single page comics about League of Legends. The Sunday Morning LoLz contest opened today, January 25, and entries will be accepted until February 15 at 11:50 pm PT. The comics must follow specific rules, or be disqualified before judging. 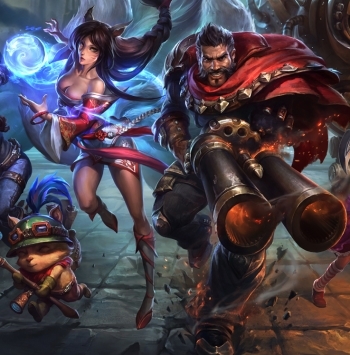 The League of Legends community will vote on qualified submissions from February 17 through 24. Five Grand Prize winners will receive a Wacom Intuos Pro Pen & Touch Medium drawing tablet. Riot will select two of the Grand Prize winners, and the remaining three will come from the community vote. All five Grand Prize winners will also receive 30,000 Riot Points, the in-game League of Legends currency purchased with real money. Five Runner Up winners will receive a 25,000 Riot Points and Wacom Inuso Manga Pen & Touch Small tablet each, and five Honorable Mention winners will take home 20,000 Riot Points each. The contest has some strict rules to follow. All of the comics must be inspired by League of Legends and must include one of the new trinket items. Words are not required, but Riot recommends using English if you do. Raunchy jokes can disqualify your comic, and Riot says the jokes must be appropriate for their youngest players (ages 12-13). Riot has provided templates that must be used, and all submissions must be JPEGs. You can draw your comic digitally or by hand and scan it in to the template, but comics made with photos or in-game screenshots won't be accepted. Riot has also put limits on the size (maximum 10 MB) and resolution of the submissions. Riot includes a sample comic in the contest announcement that follows all the rules. The contest is open to anyone with a valid League of Legends account, though if you live outside the United States you should check the official rules to make sure you can enter. Signing up for a League of Legends account is free, so it's easy to enter even if you don't already spend your evenings pushing mid with Kog'Maw. Sweet! Now all I have to do is learn how to draw. And be funny. That RP is as good as mine!